Accent pieces are a great way to update your home. They can be changed out annually or even seasonally to give you a fresh space. Wall art, decorative pillows, chairs, and window curtains are the most effective pieces you can use. As long as you start off with versatile furniture pieces, you can switch up your look whenever you please. Modern home decor accent pieces allow you to change up your entire interior design look without blowing your budget. We’ll show you three different styles to use as inspiration for your home! Our global design home accessories will add a unique and stylish look to any room of your home. These unique pieces will have you feeling like a well-traveled explorer without ever having to leave the comfort of your own home. Worldly elements with layers of texture will take your space on a journey. Embroidered pillows with geometric patterns will pop. Bring an ottoman into the space for extra seating. A distressed chest feels as if it has traveled from afar and provides extra storage. Complete the space with graphic, tribal-inspired printed window treatments and bright wall art. 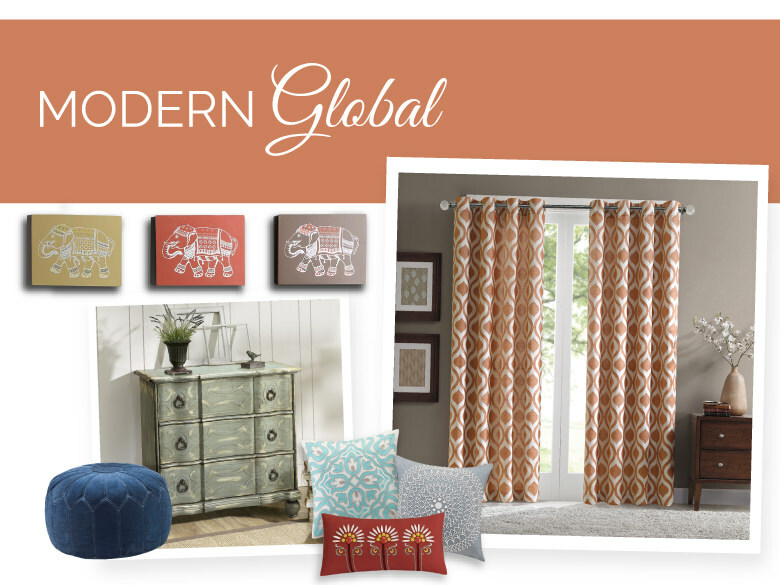 Our global interior design collection creates an eclectic and modern style right into your home. Use simple colored furniture as a blank canvas for this collection. Add pops of color with our authentic global designs home accessories. If your traditional space needs an update, then this is the collection that’s right for you. Classic and timeless styles still can use a facelift occasionally. Bring your space up to date with modern patterns used in a traditional way, like a glass top end table with a cracked wood patterned base. Use a table lamp or wall art with pops of metallic elements to bring just the right amount of modern shine to the space. Accent decor interiors are an excellent way to add a modern touch to a traditional space. A brightly colored armchair in a classic shape is the perfect way to tie everything together. 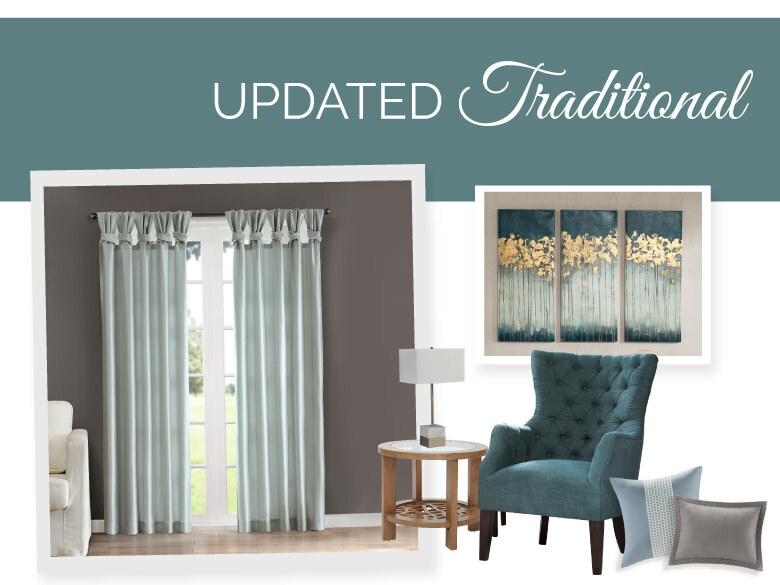 For the Updated Traditional Collection, we recommend keeping colors neutral and complimentary. The Fresh Colors Collection is perfect for bringing a breath of life back into your home. No matter what style your space is, adding bright pops of color can quickly transform it! Use bright blues and teals in modern and traditional spaces alike. Graphic wall art featuring geometric patterns are perfect for bedroom or living room spaces. Add a great lamp, accent table, or new pillow to bring a new aspect to your home. Adding vibrant colors revives a space and highlights a whole new feel in any room of the home. 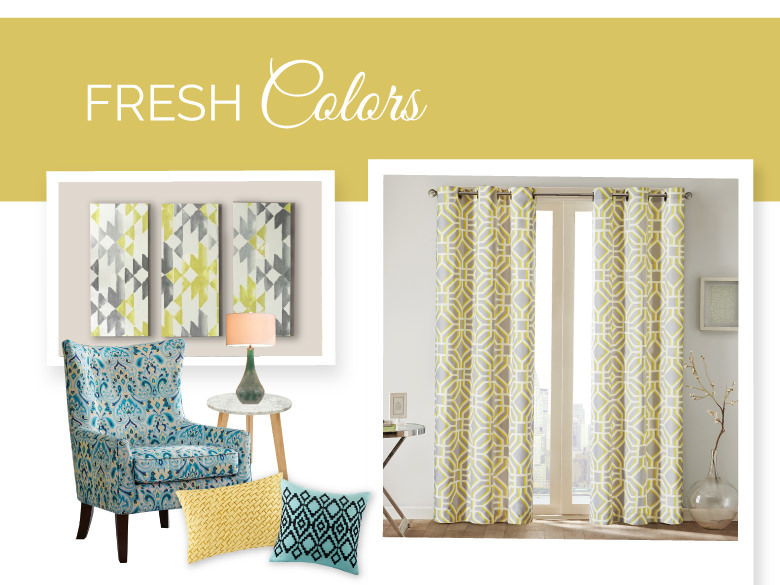 If you are looking for a modern and updated makeover, use the Fresh Colors Collection for some inspiration. Accent pillows are the fastest and easiest way to transform a space. Having a couple sets of pillows that you rotate throughout the year keeps the pillows fresh and your room always feels new! You can even swap out your pillows depending on the season so your color theme is always in style. Store your unused pillows in large, clear plastic tubs for easy access. For more home inspiration, check out all of our guides and collections on designer living to create the home of your dreams.